We’d love your help. Let us know what’s wrong with this preview of The Illumination of Ursula Flight by Anna-Marie Crowhurst. To ask other readers questions about The Illumination of Ursula Flight, please sign up. At the start of the book, you can read "my mother’s mandalore, with the fat face of a cherub carved into its neck", and I'm going crazy trying to discover what is a mandalore, because I suppose the author is not referring to a SW planet. Is that a made up or a forgotten word? Isabella Ortiz I had the same thought! My best guess is that it was a mistake, meant to be either "mandore" or "mandolin," both of which are stringed instruments. A beautifully bawdy feminist romp - part period drama, part post-modernist mayhem. Loved it. Ah. You can't beat a lively period novel, complete with a cast of memorable (and occasionally vile) characters and bawdy goings-on. Most of the best ones tend to be written several hundred years ago, yet here we are with a 21st century novel that fits right in amongst them. However, despite its strong mark of period authentici I received a copy of this book from Netgalley, in exchange for an honest review. Ah. You can't beat a lively period novel, complete with a cast of memorable (and occasionally vile) characters and bawdy goings-on. Most of the best ones tend to be written several hundred years ago, yet here we are with a 21st century novel that fits right in amongst them. However, despite its strong mark of period authenticity, it manages to feel wonderfully fresh and feisty. Ursula Flight is a wilful, gutsy child. Daughter of a parochial lord of the manor, she spends her time getting muddy in woods and putting on plays with the local kids. As a teen, her heart is stolen by the handsome Samuel, but her romantic notions are thwarted when she's told she must marry Lord Tyringham. He's rich, but unfortunately also smelly, bog-eyed and boring as hell. Ursula, not the sort to be cursed to a life of tedium, soon sets about making her own fun - especially when she meets up with Samuel again at court. Think this is a predictable love story where the woman gets her man? Think again. This book has a delightfully strong, feminist conclusion and the message is 100% clear - Ursula needs no man to 'complete her'. Hooray! There was so much to love about this book. It's clearly well-researched, because (as far as I can tell, and I'm fairly up on UK history, plus history of the theatres) it's all pretty accurate and this gives it the winning note of authenticity. Against this convincing backdrop, the author has created a wonderful array of characters. Ursula herself is a delight - unapologetically bold and gutsy, occasionally impudent, and wonderfully ambitious. Lord Tyringham is repulsive and also quite amusing at times; as is Samuel (though for quite different reasons). As for Sebeliah, Lord Tyringham's hypochondriac sister? Hilariously watery and insipid. However, despite all the liveliness and good humour, there are some serious issues explored here. Ursula's marriage to a man much older than herself is quite painful in places - not least her having to submit sexually to him. After all, this was a regular occurrence for women back then, which when you stop and think about it, sucked massively. The other struggles that females must have faced are also illustrated well - being unable to find employment, being considered a 'fallen women' without a man to look after you, being objectified at every opportunity... the list goes on. Just to emphasise, this is not a man-hating book. Yes, Ursula's husband and lover are bad 'uns; but her father is portrayed as a wonderfully progressive type, who takes the time to educate her. There are others that also treat her with the respect she deserves. So it's shown evenly - there's no man-bashing going on here. Ursula Flight is a sheer delight! Set in the time of King Charles and Nell Gwynn, Ursula is irrepressible. Her voice is captured so well by the author and the story as a whole is wittily written. The plays she writes from an early age are the highlights of the book. Such a great heroine, she finds her place, calling in life and learns to be an independent and resourceful young woman, beholden to no one. An inspiring and original story, rich in historical detail. Recommended. Ursula is one of those characters you just fall in love with the second you meet her. Born into a well to-do family, she’s fun, fierce, determined, inquisitive, imaginative, wise for her age and for the times. She December 15th, 1664. The dark night is lit up by a comet, something that wasn’t particularly seen as a good omen in those days. While this comet travels along, Ursula Flight is born and this is how her story starts and the reader is taken on the most delightful journey through her life. I read Margaret Cavendish's writing for the first time recently and, while I enjoyed its creativity, vigour and sheer oddity, I longed to get a taste of what day to day life would have really been like for an intelligent female writer of the 17th century. Danielle Dutton partly answered this in her take on Cavendish's life in her recent exquisite novel “Margaret the First”. Now Anna-Marie Crowhurst has imagined the dramatic life of a female playwright named Ursula who narrates her own story from I read Margaret Cavendish's writing for the first time recently and, while I enjoyed its creativity, vigour and sheer oddity, I longed to get a taste of what day to day life would have really been like for an intelligent female writer of the 17th century. Danielle Dutton partly answered this in her take on Cavendish's life in her recent exquisite novel “Margaret the First”. Now Anna-Marie Crowhurst has imagined the dramatic life of a female playwright named Ursula who narrates her own story from her birth in 1664 to the beginning of her writing career. She gives a richly detailed sense of what life would have been like for a privileged upperclass girl growing up on a rural estate. Amidst her narrative we're also given various documents including sketches of plays, letters, lists and notes which not only bring her story to life but chart the evolution of her creative process in becoming a writer. I took my time to read this book. Ursula is definitely an original and refreshing character. I liked the form of the book, written as a journal. The story is also good, definitely not dull. but there's still a flatness in this book, I can't put my finger on it but maybe because everything is told from Ursula's perspective and she always does and thinks the expected. I felt like she stopped being interesting after a point and unfortunately I had to push myself to read until the end, I can't say t I took my time to read this book. Ursula is definitely an original and refreshing character. I liked the form of the book, written as a journal. The story is also good, definitely not dull. but there's still a flatness in this book, I can't put my finger on it but maybe because everything is told from Ursula's perspective and she always does and thinks the expected. I felt like she stopped being interesting after a point and unfortunately I had to push myself to read until the end, I can't say this novel hooked me in. Ursula gives us the story of her life in her own inimitable fashion starting with her birth as a comet crosses the sky and her childhood encounter with an actress that sparks her interest in the theatre. Having an unusually enlightened father, Ursula learns Latin, Greek and other languages, studies astronomy and reads every book and play she can lay her hands on. Soon she’s trying her own hand at writing plays, depicting scenes of love, comedy, mischief and a little wishful thinking that are act Ursula gives us the story of her life in her own inimitable fashion starting with her birth as a comet crosses the sky and her childhood encounter with an actress that sparks her interest in the theatre. Having an unusually enlightened father, Ursula learns Latin, Greek and other languages, studies astronomy and reads every book and play she can lay her hands on. Soon she’s trying her own hand at writing plays, depicting scenes of love, comedy, mischief and a little wishful thinking that are acted out with her young friends. Unfortunately for Ursula, all the fun and games come to an end when she is promised in marriage to Lord Tyringham. As well as being an unfortunate match, Ursula misses her friends and family and finds herself bored with the responsibilities of being a wife. Things come to a head when Ursula discovers secrets about her husband that the alert reader may have suspected for some time. Although I found the whole book entertaining, I’ll admit it really picked up for me in the last third when the location changes and Ursula finally gets a chance to take her future into her own hands. Unfortunately, this is not before she has learned through bitter experience that men are not always to be trusted! The story is told in the distinctive voice the author has created for Ursula and interspersed with excerpts from Ursula's plays, diary entries and personal notes that reveal her innermost thoughts. I really enjoyed the humour in the plays and some of her lists are extremely funny. For example, her ‘Discourse on Matrimony & Wiving for New Brides’ by ‘A Married Woman Who Knoweth’ in which the most useful piece of advice is probably: ‘If all other courses fail you, and you are brought down by worries or woe or other encumbrances suffered by the dutiful wife and feel fit to burst with ill feeling and frustration and love-lack, steal yourself out of doors away from prying eyes and running as fast as and as furious as you can, scream every oath you know in English, and other languages.’ Yep, I reckon that still works. There’s also the particularly saucy list she comes up with later in the book. (Those who have read the book will immediately recognise the bit I’m talking about.) The quirky chapter headings (such as ‘In which we dine en famille and I am perturbed’) also give a sense of the period in which the book is set. The Illumination of Ursula Flight is great fun and deserves all the curtain calls and cries of ‘Author, Author’ it will no doubt receive. The Illumination of Ursula Flight is a largely lighthearted coming-of-age historical novel set in 1670s/1680s England and centres on the life (from birth to adulthood) of Ursula Flight. The book begins with a style often used by novels of the 17th century and made me immediately think of Daniel Defoe’s works. This tale is told in the first person by Ursula, a girl who is born into a well-to-do family. Her father gives her a thorough education (which was rare for girls at this time). She takes a The Illumination of Ursula Flight is a largely lighthearted coming-of-age historical novel set in 1670s/1680s England and centres on the life (from birth to adulthood) of Ursula Flight. The book begins with a style often used by novels of the 17th century and made me immediately think of Daniel Defoe’s works. This tale is told in the first person by Ursula, a girl who is born into a well-to-do family. Her father gives her a thorough education (which was rare for girls at this time). She takes a keen interest in learning and has a talent for playwriting from a young age. Marriage, loss, love, and adversity bring her towards maturity and self-realisation. I was expecting a lot from this after reading some of the reviews. Also the hardback copy was to pretty and enticing to ignore. The writing is strong and the setting of restoration England was fascinating. It was great to read of the lives of women in this era. I find myself to often in Tudor England or Victorian England! Ursula is an interesting character and as everything is written in a diary form we really only get to know Ursula. This is were I struggled, the other characters piqued my intere I was expecting a lot from this after reading some of the reviews. Also the hardback copy was to pretty and enticing to ignore. This is were I struggled, the other characters piqued my interest and I wanted to know more of them. After a while I found Ursula a little predictable and the story along with her. There were hints of Michael Fabers Crimson Petal and the White and around half way through the book I felt it started to become more of a romp however this was short lived and the wilder side of Ursulas character felt lost somewhat again. I wanted to love this book. Still worth a read, just a little more vanilla than I was expecting. Oh my days! My first read of 2019 and it has already set the bar very high indeed for the rest of the books I plan to read this year. The Illumination of Ursula Flight is a mesmerising and fearless frolic featuring a feisty female protagonist that it’s pretty impossible not to fall in love with. As with all the memorable heroines who standout in historical literature, the journey of self discovery that Ursula undertakes strips her character back to the bone, revealing every personality flaw but Oh my days! My first read of 2019 and it has already set the bar very high indeed for the rest of the books I plan to read this year. The Illumination of Ursula Flight is a mesmerising and fearless frolic featuring a feisty female protagonist that it’s pretty impossible not to fall in love with. As with all the memorable heroines who standout in historical literature, the journey of self discovery that Ursula undertakes strips her character back to the bone, revealing every personality flaw but that just made me adore her even more. So move over Becky Sharp and Amber St Clare, Ursula Flight is here to grab your attention from the minute she bursts into the world on the same night that a spectacular comet lights up the sky bringing fear to the population of bad luck to come. I am a big fan of historical fiction set within this period and so I am very critical if it fails to live up to my expectations! But this book was just perfect in my eyes! The author captured the era with an almost cinematic reality that brought the setting to life with a vivid imagery so that every scene felt authentic and realistically involving. This was a time where women felt undervalued members of society so to see Ursula take her schooling to heart and realise she had a talent that she had to take to the masses meant that I was cheering her on every step of the way. Yes, she made mistakes but that only made her more likeable, I thought, and brought out her determination to succeed. Ursula is a character I won’t forget in a hurry. Her free spirited and boisterous personality gave the narrative a wonderful humour which cut through the tense drama of the piece whilst still keeping the essence of the historical context. And what helped was the way in which parts of the plot were explored using Restoration plays as this gave the characters a different voice in which to communicate with each other. A light and fast read with some very amusing segments as Ursula Flight pursues her dreams of independence and success as a playwright in Restoration London. Her success is mixed.... and the pitfalls lying in wait for young attractive women of means are plenty. The pages skipped through the fingers. Perhaps frothier than I expected but still fun with an interesting format, which includes extracts from all manner of Ursula's scribblings. Review to follow shortly on For Winter Nights. 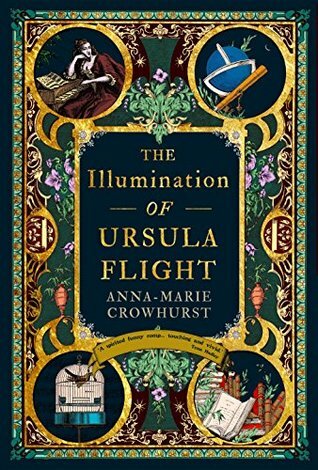 The Illumination of Ursula Flight is the first novel by British author, Anna-Marie Crowhurst. On December 15th, 1664, a daughter was born to Clifford Flight. Seeing the Great Bear in the night sky, he named her Ursula. At seven years of age, Ursula encountered a Drury Lane actress, and was enthralled with the whole concept of acting. By eight, her father was educating her thoroughly: literature, languages, drama, astronomy and more. Ursula also began writing her own plays and putting them on with friends. But at fifteen, her mother saw to it that she was given to a man twenty years her elder in marriage. Lord Tyringham’s position in the House of Lords regularly took him from his Wiltshire estate. Would her husband indulge Ursula’s love of theatre and take her to Drury Lane when he went to London? Would she get to meet the King and Queen? Crowhurst’s tale follows Ursula through a childhood cut abruptly short, an unhappy marriage, and a short-lived affair that sees her fending for herself in London. Told in a first-person narrative, Ursula shows herself to be clever and determined, although she is sometimes quite shallow, and she is certainly well ahead of her time with regards her attitude and independence. As well as Ursula’s narrative, there are her plays (or parts thereof), her many lists, letters sent and received, her rules, her diary, transcripts of conversations and an agenda. While there are quite a few unhappy times for Ursula, there’s also quite a bit of humour and, overall, this is an easy and enjoyable read. With thanks to Allen & Unwin for this Proof Copy to read and review. Which is fortunate as hers is the only perspective you're going to get...and I still loved it! Set in 17th-century England, Ursula dreams of being a playwright. She writes plays to entertain her friends as she grows in a privileged environment and then she is married off at a very young age but plots her escape from the ties that bind her. Her dreams do not diminish and she continues to seek the life she desires no matter what life throws at her. Her journal is punctuated with funny I love Ursula! Her dreams do not diminish and she continues to seek the life she desires no matter what life throws at her. Her journal is punctuated with funny lists, musings and parts of plays (starring Ursula herself usually!). I love her pluck and courage and I love that she refuses to be restrained by expectations. The story of Ursula who wants to be a playwright in 17th century London, despite it being dominated by men and the theatre being no place for a lady. This is a wonderful romp through Restoration England with shades of Tristram Shandy and Moll Flanders. DNF on page 2. Literally unreadable--as in, I couldn't read the words. The publishers have chosen to format the epub PDF-style to keep all their lovely pretty layout twiddles, including the folios (ie the printed page numbers, very useful in an ebook, good thinking chaps), as a result of which the type comes up as a point size of maybe 6 on my Kobo Aura. Any attempt to enlarge it knocks off lines at the bottom of the page, rendering the reading experience either eye-straining or fiddly and tedio DNF on page 2. Literally unreadable--as in, I couldn't read the words. The publishers have chosen to format the epub PDF-style to keep all their lovely pretty layout twiddles, including the folios (ie the printed page numbers, very useful in an ebook, good thinking chaps), as a result of which the type comes up as a point size of maybe 6 on my Kobo Aura. Any attempt to enlarge it knocks off lines at the bottom of the page, rendering the reading experience either eye-straining or fiddly and tedious. Read and reviewed for Lovereading..
A wonderful , fun, charming book, Ursula, is the perfect heroine, I would love to see it made into a film. If you are looking for a fabulous new character to welcome into your life, then look no further! Ursula Flight is a delight!! From a inquisitive and imaginative child, to a determined and feisty woman, this book follows Ursula in a sparkling debut set in the 17th century. Another thing I loved about this book was the way the story was written. It's all from the pen of Ursula, such as diary entries (think of the historic equivalent to Adrian Mole, or Bridget Jones! ), alongside plays she wrote and If you are looking for a fabulous new character to welcome into your life, then look no further! Ursula Flight is a delight!! From a inquisitive and imaginative child, to a determined and feisty woman, this book follows Ursula in a sparkling debut set in the 17th century. Another thing I loved about this book was the way the story was written. It's all from the pen of Ursula, such as diary entries (think of the historic equivalent to Adrian Mole, or Bridget Jones! ), alongside plays she wrote and performed in linked to episodes in her life that she witnessed or imagined, and it just made for such a light and refreshing read that was full of laughs, spirit and had that feelgood factor that just made me want more! Ursula was born on the night of the comet, and throughout her childhood she always felt different to many others. She is from a well to do family and is educated by her father who she idolises. Her relationship with her mother was a little more difficult and that was also a revealing side to the story as her life progresses. The historical side to the story is also very well done and you never feel like you're just looking back, you feel like you're a fly on the wall as she travels to various places, experiences new things and the expectations placed on her as a female of the time. But Ursula has different ideas and isn't afraid to speak her mind and this can lead to problems for her when she's expected to know her place and stay quiet. With an education behind her she is never happy to just settle for a domestic life, and her dream is to write plays for the theatres of London. And with such a determined character such as Ursula, you never doubt her desire to achieve these ambitions, despite those around her doing their best to thwart them. She has to overcome a number of hurdles put in her way but she even approaches these with a wonderful sense of humour and humility. Gotta say, I really loved this book. I loved how it incorporated different kinds of texts including playwriting by the main character Ursula, and also poetry. It was just so interesting to see Ursula go through the years and achieve her goal of becoming a playwright and actress. I loved the fact that Ursula doesn't stop in trying. She was such a strong and quirky character who you could get behind. She's witty and sarcastic and just an overall loveable character. I really enjoyed this and how it Gotta say, I really loved this book. It's a book I couldn't put down and would definitely recommend. It was full of humour, wit and charm and I enjoyed seeing Ursula grow and become independent and stronger in her convictions. A beautifully written historical novel that will appeal to fans of Alison Weir, Philippa Gregory and Anne O'Brien. Set in 17th Century England this is a stunningly inventive novel that focuses on Ursuala Flight. Her narration is partly formed by diary entries and scripts, and this is a really interesting addition and allows the reader to get additional insights into her character and what she is thinking and feeling. I've read quite a few books set in the same time period and this one is wonderful A beautifully written historical novel that will appeal to fans of Alison Weir, Philippa Gregory and Anne O'Brien. I've read quite a few books set in the same time period and this one is wonderful, it is so detailed in it's descriptions that you'll feel as if you have stepped back in time. Thank you to netgalley for the chance to read this. This is such an entertaining and fun romp set during the reign of King Charles II. Ursula Flight is born on the night of a comet. She’s strong willed, grows up to be a budding playwright and, by all accounts, is a 17th century feminist. This is her story as narrated by the girl herself in her own special and unique way. I loved Ursula and her quirky voice. She’s a fantastic character with a great personality. She’s intelligent, feisty and determined. There is also a whole other cast of fascinatin This is such an entertaining and fun romp set during the reign of King Charles II. Ursula Flight is born on the night of a comet. She’s strong willed, grows up to be a budding playwright and, by all accounts, is a 17th century feminist. This is her story as narrated by the girl herself in her own special and unique way. I loved Ursula and her quirky voice. She’s a fantastic character with a great personality. She’s intelligent, feisty and determined. There is also a whole other cast of fascinating dramatis personae who all add to this engaging story and make it the lively and enjoyable read it is. I thought it was very original and quite unusual. I particularly liked the theatrical plays as written by Ursula as a parody of her life, along with the lists of various things, letters and diary entries which all combined to make this bawdy tale so delightful. It’s beautifully and thoughtfully written with both sad and amusing moments. A captivating, easy to read and enchanting drama which I applaud with vigour. I do so hope there will be an encore from this new author. Many thanks to Jellybooks for giving me the opportunity to read this book. Set in 17th - Century Britain, this is a lush, vivid story of the life of Ursula Flight. Written as a story but also in diary and script form, it is wonderful. I loved watching Ursula grow with every chapter and would highly recommend it to everyone. That was never going to work out for Ursula. This delightful novel is filled to the brim with cheek and sass, quite a bit of heartache, plenty of points to shudder at and moan over but above all, joy and hope, all played out against a very 17th century English background. In many ways, The Illumination of Ursula Flight is reminiscent of Jane Austen, with her witty banter and the depiction of characters with all of their ridiculous antics and insufferable assumptions about the intelligence, or lack thereof, of women. I laughed my way through The Illumination of Ursula Flight, but there were plenty of tender moments as well which brought a lump to my throat. Ursula’s path is definitely not an easy one and at times you think there is no possible way for her to be happy, but her resourcefulness and self-integrity hold fast, and I loved the way she was unwilling to just accept her lot in life. She hits some very low points indeed, including almost starving to death, but she doesn’t let this put her off from her ultimate goal: to be an independent woman with a creative career, something almost impossible to achieve in 17th century England. This novel really is an experience, such a delightful read. I like nothing more than a novel that’s quirky and unique, especially if it’s filled with intelligence, wit and a wealth of history. By far my favourite novel so far this year, it’s one I will be recommending again and again. I’d like to finish up with this note from the author on the inspiration that led to her creation of The Illumination of Ursula Flight. As well as providing historical context, it highlights the empowering aspect of this novel. The Illumination Of Ursula Flight’ is Anna-Marie’s debut novel and what a debut novel it is. I read the synopsis and I was intrigued because it seemed different to most of the books I read and well they do say a change is as good as a rest. I opened the book and began to read. I couldn’t help but take to the character of Ursula Flight from the first moment I met her as it were. The story begins in 1664 when Ursula is a little girl and follows her life down through the years from childhood to adul The Illumination Of Ursula Flight’ is Anna-Marie’s debut novel and what a debut novel it is. I read the synopsis and I was intrigued because it seemed different to most of the books I read and well they do say a change is as good as a rest. I opened the book and began to read. Historical literary fiction is doing rather well at the moment, and the casual reader could be forgiven for feeling perhaps a bit wearied of the whole thing: the elaborate covers, the gushing praise, the mannered titles. I'm here to tell you that The Illumination of Ursula Flight is worth the read. It would appeal, I think, to fans of The Mermaid and Mrs. Hancock, but it is in many ways a very different book. Ursula, our protagonist, speaks to us in her own voice throughout, and it is a voice wi Historical literary fiction is doing rather well at the moment, and the casual reader could be forgiven for feeling perhaps a bit wearied of the whole thing: the elaborate covers, the gushing praise, the mannered titles. I'm here to tell you that The Illumination of Ursula Flight is worth the read. It would appeal, I think, to fans of The Mermaid and Mrs. Hancock, but it is in many ways a very different book. Ursula, our protagonist, speaks to us in her own voice throughout, and it is a voice with wit, sparkle, and plenty of youthful callowness; she is far from a flawless heroine, making decisions that remind us of how very young she is when cast into the world (fifteen at her marriage, nineteen at the end of the book). If, occasionally, she almost seems more adult in her thinking than is plausible, recall Becky Sharp of Vanity Fair, who claimed to have ceased being a child at the age of eight. Ursula is born on the night of the Great Comet in 1664, just before the Restoration of Charles II. Throughout the book, the tensions in England - vanquished Puritans vs. decadent courtiers - are mirrored by the tensions in Ursula's own life: her family is noble but needs money and so she is married off to the dour (and foul-smelling) Lord Tyringham, whose devoutness is matched only by his hypocrisy (he has an almost fetishistic fondness for plain clothes that leads him to sexually assault his female servants). Ursula, who has grown up surrounded by love and the freedom to roam the fields, read what she will, and write her own plays, is suffocated by marriage; she takes joy in the Court, in fashion, and in the theatre. It may be a cruel world, but it glitters. Thank you to the publishers for providing me with a finished copy in exchange for an honest opinion. I had no idea what to expect going into this book, but I certainly did not expect to leave it with so much admiration. Anna-Marie Crowhurst has done a splendid job with this book regarding plot, character development and writing, and the use of scripts within it kept me completely engaged. I found this book truly inspiring and Ursula to be such a strong character that I greatly admire. Yes she has done wrong, but she learned from her mistakes and moved onwards to create a better future for herself. Ursula was a very real sort of character, one that many of us can relate to and look to for advice and comfort. She was aware of her wrong-doings but never gave up, instead stayed grounded and persisted through it all (and these are the characteristics that I look for in a protagonist!). I would also like to just take a moment and discuss the amazing writing style of this book, because the thing is we weren’t just reading text upon text upon text (as you do with books). We had plays/ scripts, diary entries, and articles to keep us entertained and engaged. Because of this effort I never once felt bored or the inclination to put it down, and honestly Anna-Marie writes with is truly stunning. It’s immersive and enticing and I just wanted to keep turning the page to find out more. I felt completely transported into this novel and as though I really was in the Restoration period, what with the vivid descriptions of the city, fashion and sightings. The pace was done to perfection and it was clear that the author had put in a lot of research in order to make this as accurate as can be.